Shakespeare’s farcical comedy of twins and mistaken identity. The Comedy of Errors is believed to be one of Shakespeare’s earlier written plays. 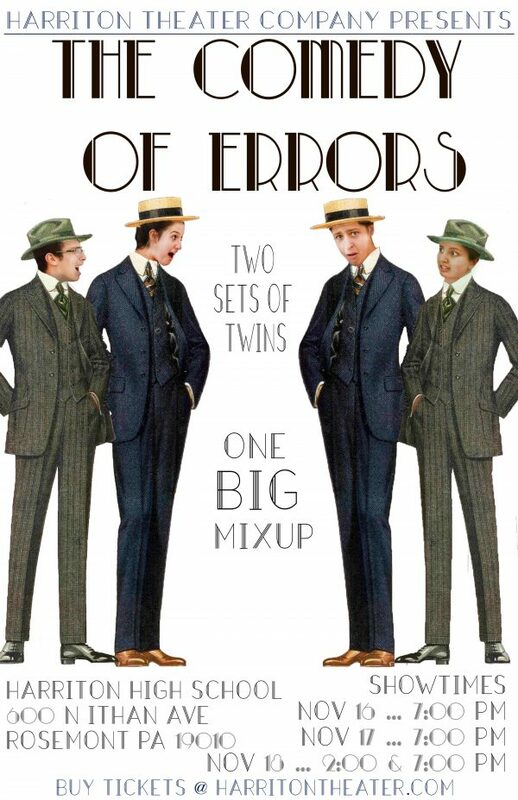 Harriton Theater Company presents this humourous comedy about separated family and mistaken identity. The play begins with Aegeon telling his story. Thirty-three years before the play begins Aegeon, a merchant of Syracuse, became the father of twin boys. He named them both Antipholus and bought another pair of twins, both named Dromio, to be their servants. Aegeon and his wife were travelling home with their sons and the servants when they were shipwrecked in a violent storm. Aegeon managed to save only one Antipholus and one Dromio and he has never seen the rest of his family since. Antipholus and Dromio arrive in Ephesus in search of their long-lost twin brothers, unaware that their father has also arrived there on the same quest. As a citizen of Syracuse, a city at war with Ephesus, Aegeon has landed illegally in Ephesus and is arrested and condemned to death unless a ransom is paid by sunset. Unknown to all of them, the lost Antipholus and Dromio have been living in Ephesus for many years.